“That the Hebrew vowel-points are ancient, might be easily proved; that they give, as near as we can come to it, the true ancient pronunciation, is pretty clear from the Hebrew names retained by the Septuagint, and by quotations of Hebrew in other letters found in the primitive fathers; and that thus far they are of considerable use, none of their opponents should deny: but that they are coeval with the Hebrew language has never been proved, and never can be proved; and that they are not necessary to a radical knowledge of the language, every person knows who is at all acquainted with its nature; and lastly, that they are of no importance in biblical criticism, the unsettled controversy concerning them fully ascertains. The best defence of them ever published is that by Mr. Peter Whitfield, Liverpool, 1748, 4to.”—Dr. Clarke’s Bibliographical Dictionary. 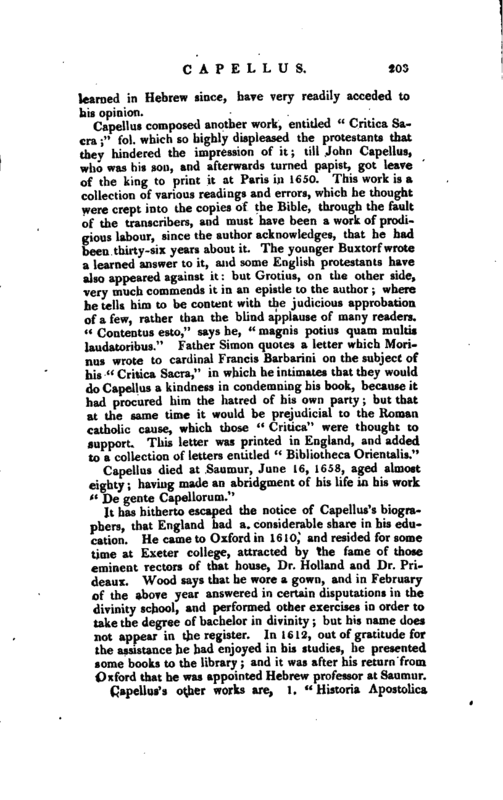 This opinion of their late invention was taken up by Capellus, who defended it in a very excellent and learned treatise entitled “Arcanum punctuationis revelatum,” &c. which work, after being refused a licence in France and at Geneva, was printed in Holland, and caused a great clamour among the protestants, as if it had a tendency to hurt their cause. It is, however, certain, that Luther, Calvin, Zuinglius, and others, had espoused the same notion as well as the Scaligers, Casaubons, Erpenius, Salmasius, Grotius, and the Heinsii; and therefore it could not be said, that Capellus introduced any novelty, but only more solidly established an opinion, which had been approved of by the most learned and judicious protestants. 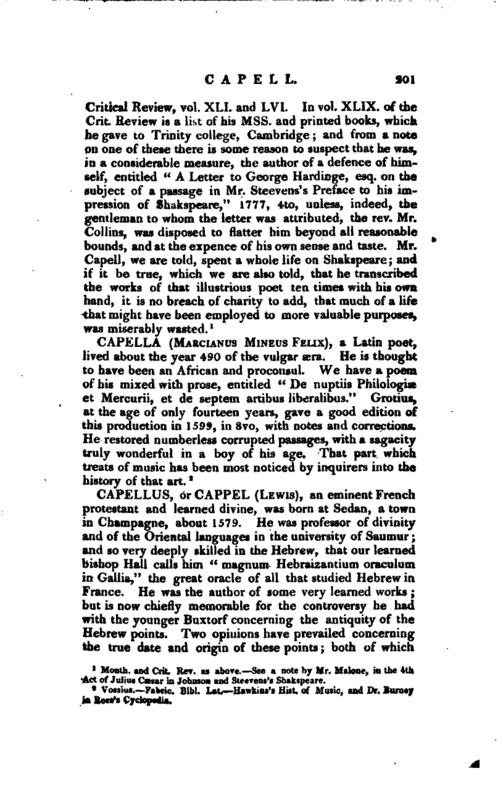 The true reason, perhaps, why the German protestants in general so warmly opposed Capellus’s opinion, was, that they had been accustomed to follow that of the two Buxtorfs, whom they considered as oracles in Hebrew learning. Buxtorf the father had written a little treatise in defence of the antiquity of the points; and as Buxtorfs credit was justly great among them, they chose rather to rely upon his authority than to examine his arguments, in so abstruse an inquiry. 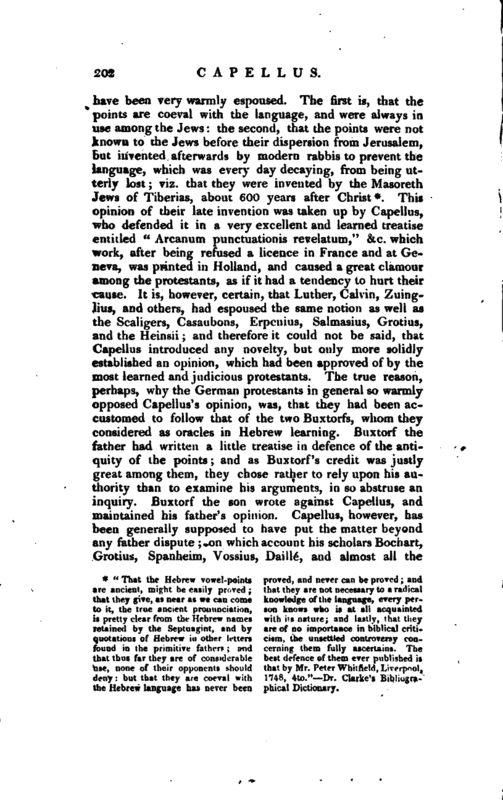 Buxtorf the son wrote against Capellus, and maintained his father’s opinion. 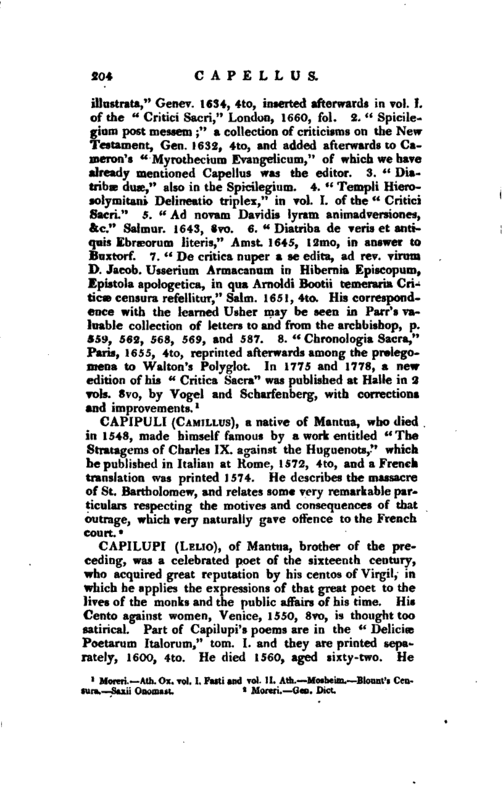 Capellus, however, has been generally supposed to have put the matter beyond any father dispute; on which account his scholars Bochart, Grotius, Spanheim, Vossius, Daille, and almost all the | learned in Hebrew since, have very readily acceded to his opinion. Moreri. —Ath. Ox. vol. I. Fasti and vol. II. Ath. Mosheim.- Blount’s Censura. —Saxii Onomast.